TORONTO (Jan. 29) — Kyle Dubas made a solid move on Monday by acquiring defenseman Jake Muzzin from the Los Angeles Kings. Muzzin is, by no means, a difference–maker, but he does perform somewhat aggressively and should complement Morgan Rielly rather well. Indications suggest the Maple Leafs general manager isn’t done. Dubas may, in fact, be working on something bigger with the St. Louis Blues. At the end of July, I wrote in this space (http://bit.ly/2LtYkPT) that the Leafs and Blues were talking… possibly about mammoth defenseman Colton Parayko. 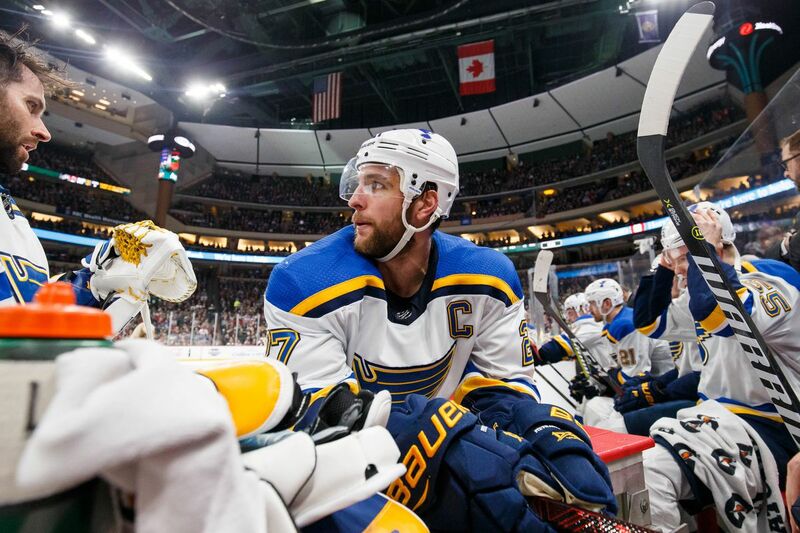 My source tells me that Dubas and St. Louis GM Doug Armstrong are “still in touch”; Dubas continuing to “kick tires” with respect to Parayko and fellow blue–liner Alex Pietrangelo. The latter missed nearly a month after sustaining an injury to his left hand in a game at the Pepsi Center, Dec. 1, against the Colorado Avalanche. He returned at home against Pittsburgh on Dec. 29, contributing a goal and seven assists in the ensuing 14 matches. When healthy and in playing–shape, Pietrangelo is among the Top 10 defensemen in the National Hockey League. Tall (6–foot–3) and rangy with a heavy shot, the 29–year–old native of King City (north of Toronto) has put up good numbers since being drafted fourth overall by St. Louis in 2008 (behind Steven Stamkos, Drew Doughty and Zach Bogosian… and one spot ahead of Toronto pick Luke Schenn). Alex has seasons of 54, 51, 51 and 48 points with the Blues. He scored 15 goals last season; 14 the previous year, and is deceptively quick for his size. He is also captain of the Blues and would add veteran maturity to the Maple Leafs. Were Dubas able to acquire him before the Feb. 25 NHL trade deadline, the club would be more–solidly equipped for a deep playoff run. Muzzin came to Toronto for prospects and a first–round pick. Normally, acquiring a first or second–pairing defenseman without giving up a roster player would be quite a coup. Dubas, however, must offload salary before next season, with Auston Matthews, Mitch Marner and Kasperi Kapanen among those needing to be signed. He can let Jake Gardiner “walk” in the summer as an unrestricted free agent… or include him in a trade–proposal to the Blues. I suspect that Gardiner and Kapanen would catch the attention of Armstrong, and perhaps already have. Nor would I be at all hesitant to move William Nylander instead of Kapanen, as Nylander’s contract (six years, $41.8 million with a $6.9 million cap–hit) will handcuff Dubas prior to next season. Pietrangelo would have to waive a no–trade clause and has one year left with a manageable cap–hit of $6.5 million. After growing up in the Toronto area, he’d likely be thrilled to join a contending Leafs team. A Top–4 defense unit of Pietrangelo, Rielly, Muzzin and Ron Hainsey would substantially improve the club. Acquiring Muzzin added $4 million to the Toronto cap–crunch of next season, so Dubas will need to unload more than just Gardiner and some other spare parts (none of Tyler Ennis, Martin Marincin, Igor Ozhiganov, Par Lindholm or Hainsey will likely return). Andreas Johnsson has some potential as a goal–scorer but may also need to be moved rather than re–signed as a restricted free agent. Kapanen will command a deal in the range of $5 million per season and may be every–bit the equivalent of Nylander; perhaps more valuable. It will be quite challenging for Dubas to keep both players under the cap. That’s why swapping one to St. Louis in a trade for Pietrangelo would make abundant sense. It should be quite interesting in these parts before Feb. 25. They formed the most–prolific tandem in my youth and remain among the best NHL players to ever wear the same uniform at the same time. Bobby Orr and Phil Esposito — teammates with the Boston Bruins from May 15, 1967 to November 7, 1975. Together, they annihilated scoring records in the late 1960’s and early–70’s; winning the Stanley Cup in 1970 and 1972. Their birthdays are one month apart: Esposito, Feb. 20; Orr, Mar. 20. Orr is still considered, by many, the greatest hockey player of all time; standing, at the very least, alongside Wayne Gretzky. He remains, more than 40 years after his last game, the only defenseman to win the Art Ross Trophy as NHL points leader (in 1969–70 and 1974–75). 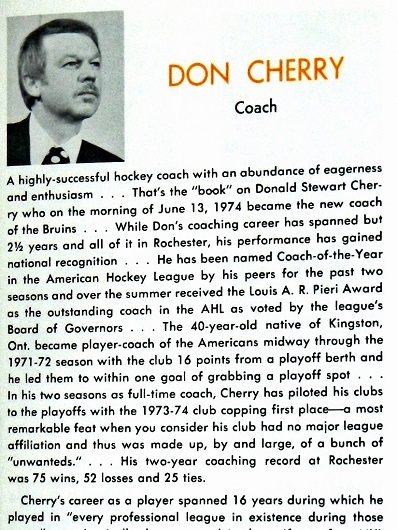 Such a feat, prior to his arrival with the Bruins, wasn’t remotely considered. 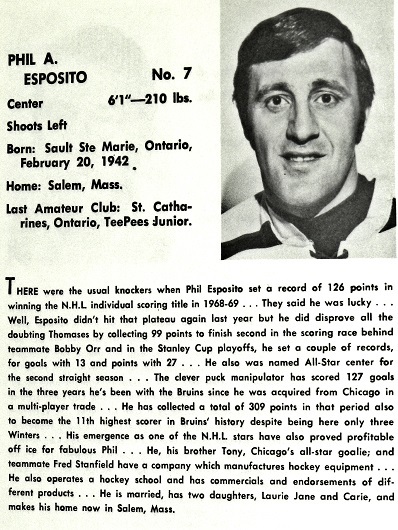 Esposito, a center acquired from Chicago, was the first player to amass 100 points in a season; the first to score 60 and 70 goals. 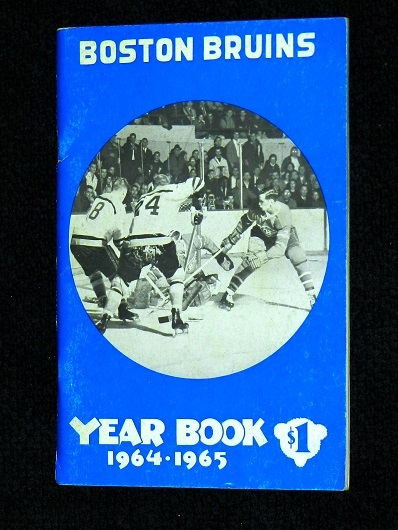 Orr and Esposito combined to win the Art Ross Trophy in seven consecutive seasons (1968–69 to 1974–75). Both, of course are in the Hockey Hall of Fame. 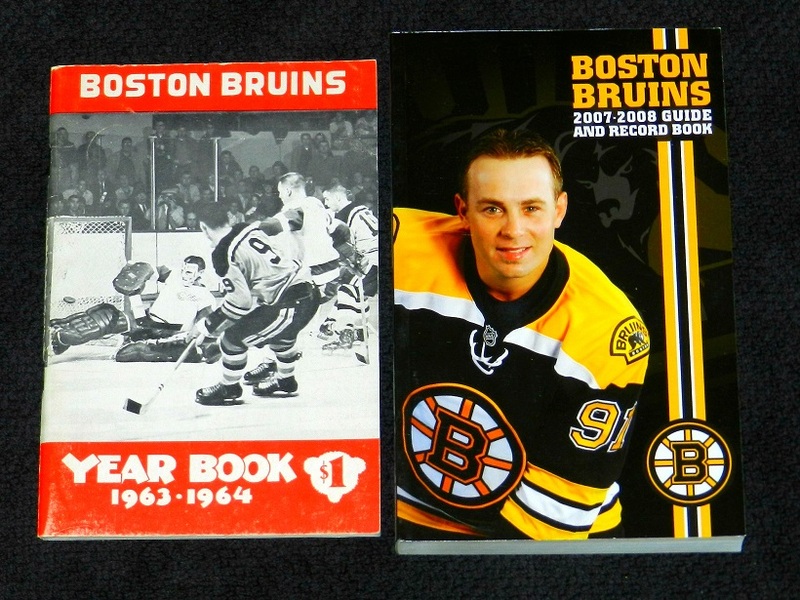 I was reminded, this week, of how splendidly they worked together while digging through my collection of Bruins media guides (45 consecutive editions: 1963–64 to 2007–08), as per below. 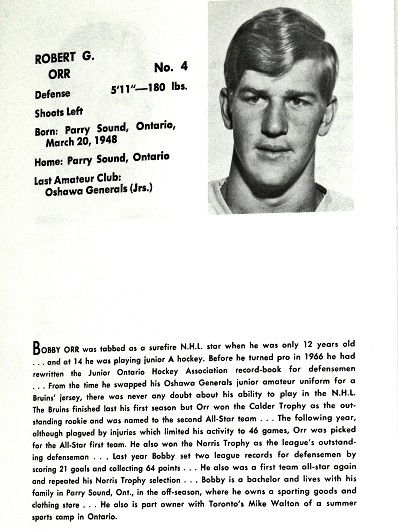 After a phenomenal Junior career with the Oshawa Generals, Orr joined Boston at 18 years of age for the 1966–67 season. 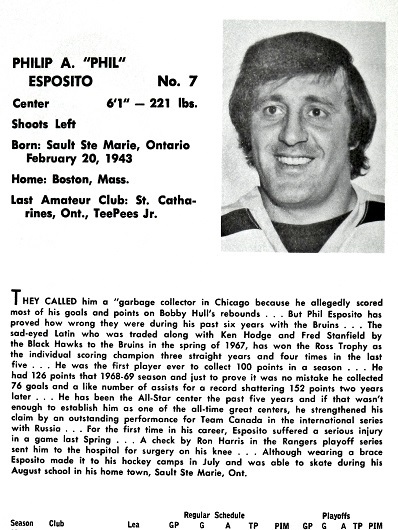 Esposito came over from the Black Hawks in May 1967 as part of the most lop–sided trade in NHL history. Knee issues and the lack of technology we have today (arthroscopic surgery) severely limited Orr’s career. 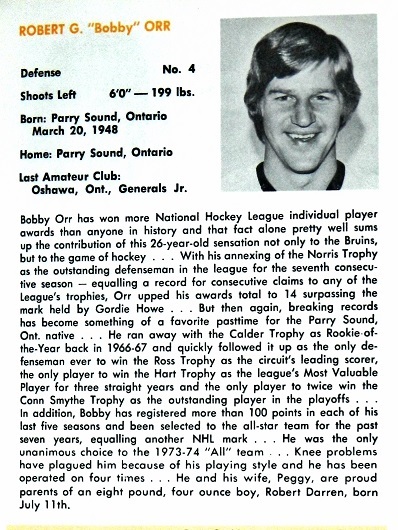 During a 12–year stretch (1966–67 to 1977–78), Orr missed 277 regular–season games — 70 in 1975–76 with Boston and 60 in 1976–77 with Chicago. 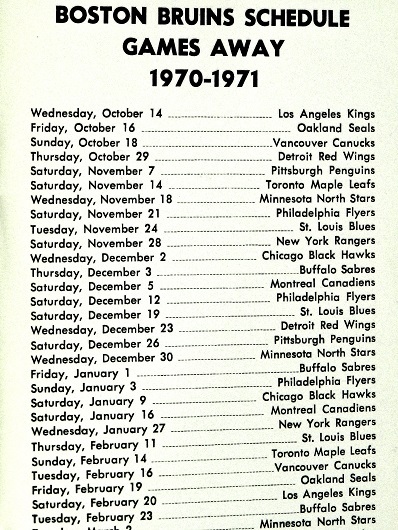 He then sat out the entire 1977–78 schedule. We can merely imagine his numbers were he able to stick around at reasonable health over, say, 20 years. Yes, it does look odd to see someone other than Bobby Orr wearing No. 4 for the Bruins. 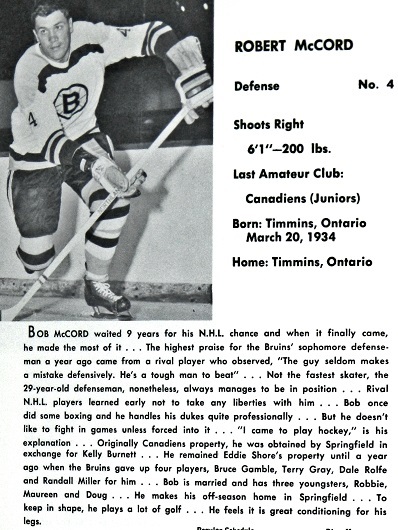 In 1964–65, defenseman Bob McCord (above) appeared in 43 games. He would become a regular with the Minnesota North Stars in the early years of expansion. McCord died Oct. 21, 2016. And, the last Bruin to wear the jersey before Orr was Al Langlois (below), who played 65 games in 1965–66, his final NHL season. 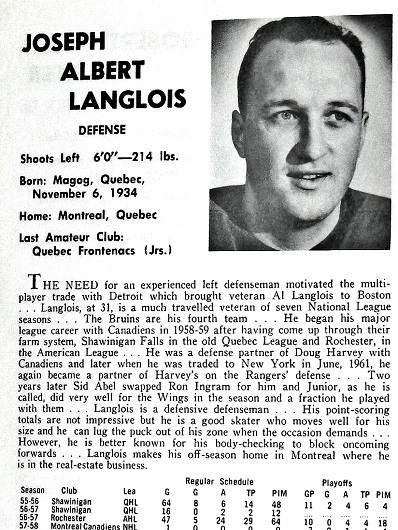 Langlois is now 84. Orr’s No. 4 jersey was retired in a pre–game ceremony at the Boston Garden on Jan. 9, 1979. 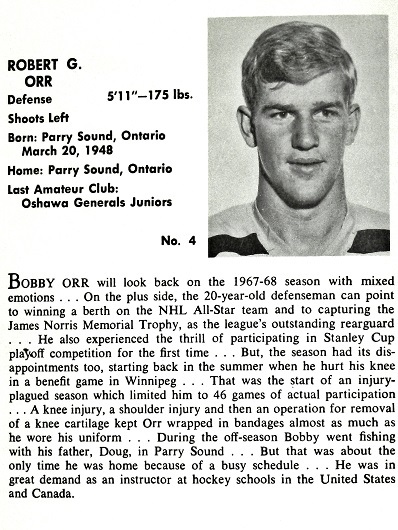 After missing the playoffs seven consecutive years in the old six–team NHL, the 1966–67 Bruins looked to Bobby Orr for hope — as was evident (below) in Orr’s first–ever bio for the club’s media guide. 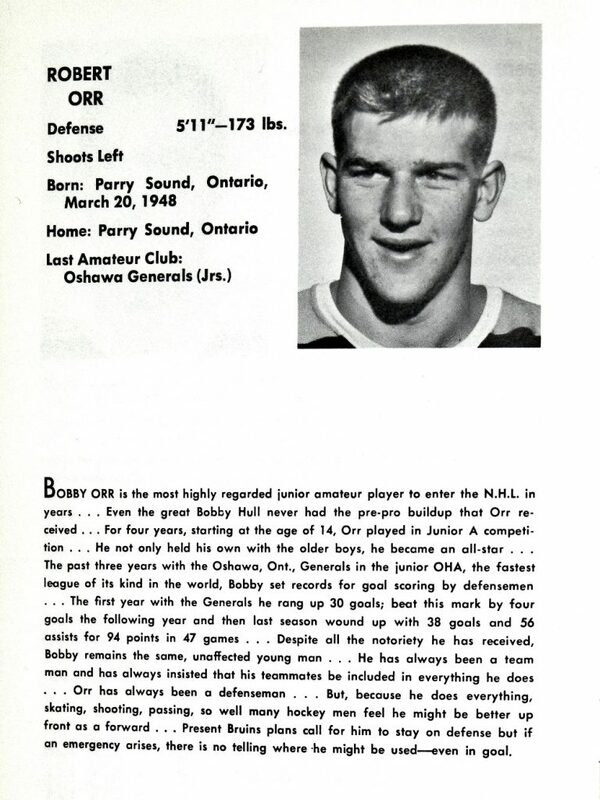 BOBBY ORR 1966–67: GP–61 G–13 A–21 PTS–38. Orr made his NHL debut on Oct. 19, 1966 (top–left) at home to Gordie Howe and Detroit, recording an assist in the Bruins 6–2 romp over the Red Wings. 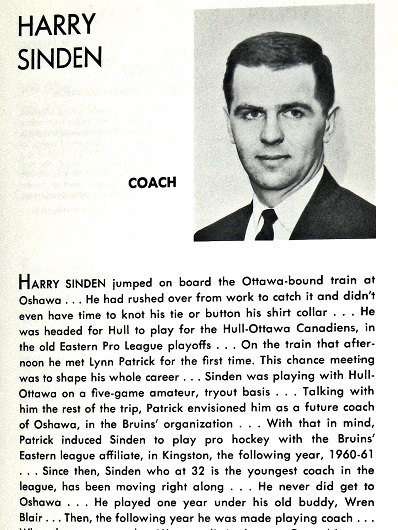 Orr was joined by another rookie: Boston coach Harry Sinden (top–right). 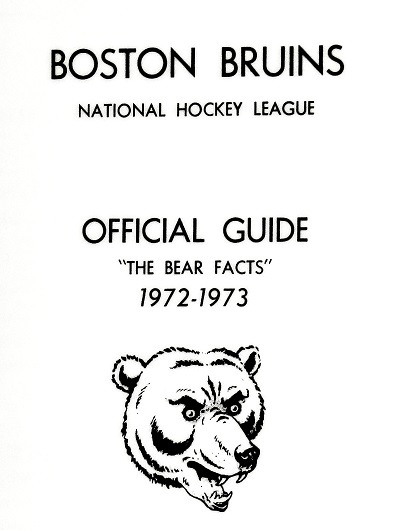 With a lack of scoring punch, the Bruins missed the playoffs for an eighth consecutive season. 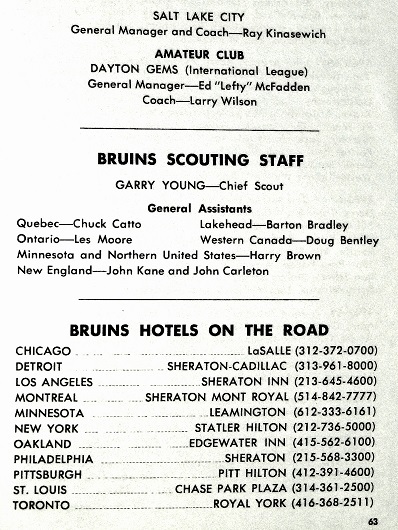 The Bruins addressed their scoring need and became a Stanley Cup threat on the afternoon of May 15, 1967 when GM Milt Schmidt acquired Esposito, Ken Hodge and Fred Stanfield from Chicago for Pit Martin, Gilles Marotte and goalie Jack Norris. At the time, it seemed like a fair swap, as Esposito had not performed well for the Black Hawks in a six–game semifinal playoff upset by the Maple Leafs. But, it turned into the most lop–sided statistical trade in NHL history — rivaled, slightly, by only two others: Detroit sending Marcel Dionne to Los Angeles in 1975 and, of course, Edmonton trading Wayne Gretzky to the Kings in August 1988. 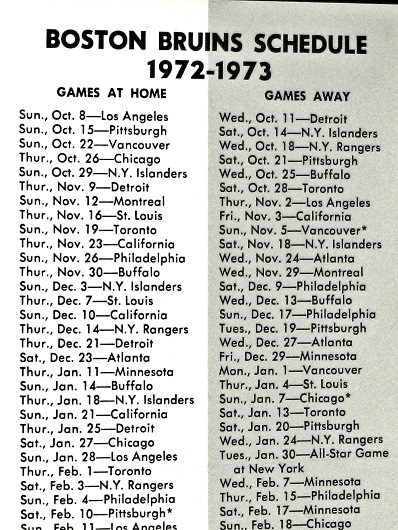 Orr and Esposito suited up together for the first time on Opening Night (Oct. 11) of the 1967–68 schedule in a 4–4 tie with Detroit at the Boston Garden. 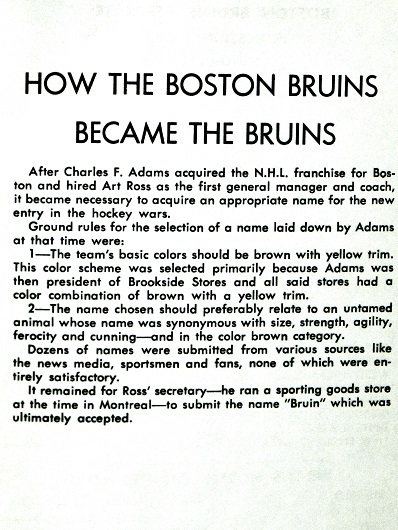 The Bruins made the playoffs for the first time since 1959 and were swept by Montreal in the opening round. The Canadiens beat expansion St. Louis for the Stanley Cup. BOBBY ORR 1967–68: GP–46 G–11 A–20 PTS–31. 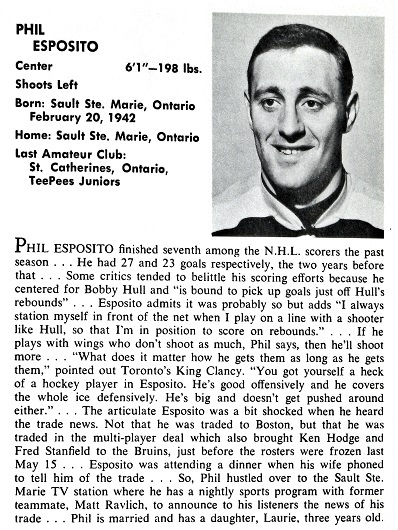 PHIL ESPOSITO 1967–68: GP–74 G–35 A–49 PTS–84. 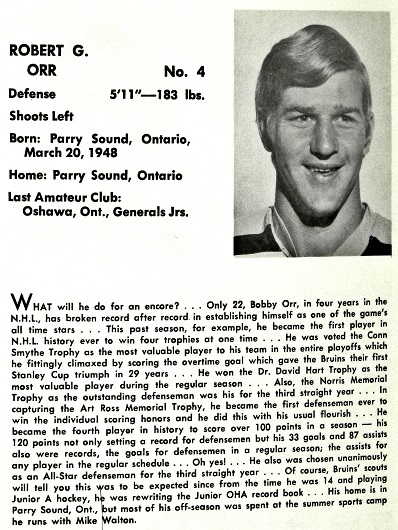 While appearing in a career–high (to that point) 67 games (missing nine), Orr broke into superstardom during the 1968–69 season. He established NHL records for goals and points by a defenseman. 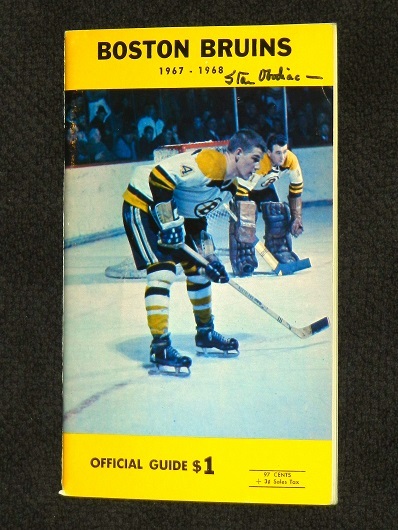 The cover of the Bruins’ ’68–69 media guide (top–left) showed the remarkable press box location at the old Boston Garden. I had the pleasure of covering a few games from that perch; you could hear conversations on the ice. In his second full season with the Bruins, Esposito obliterated the NHL marks for assists and points, becoming the first player to amass 100 or more points in one season. 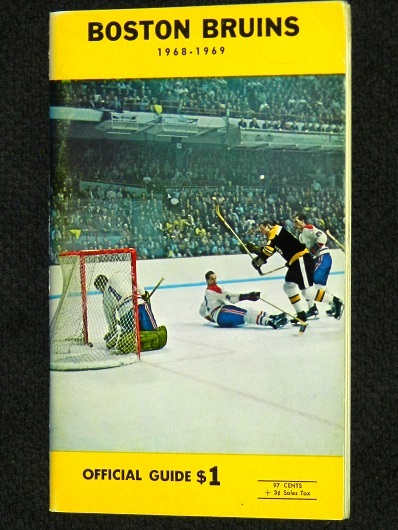 The Bruins advanced to Game 6 of the Stanley Cup semifinals before losing on an overtime goal at the Garden by Montreal’s Jean Beliveau. It was first NHL game called on TV by now–legendary broadcaster Bob Cole. BOBBY ORR 1968–69: GP–67 G–21 A–43 PTS–64. 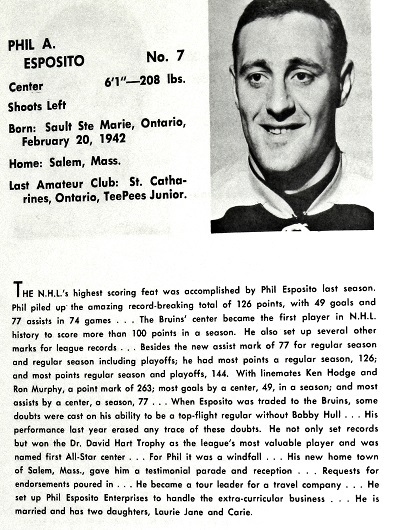 PHIL ESPOSITO 1968–68: GP–74 G–49 A–77 PTS–126. 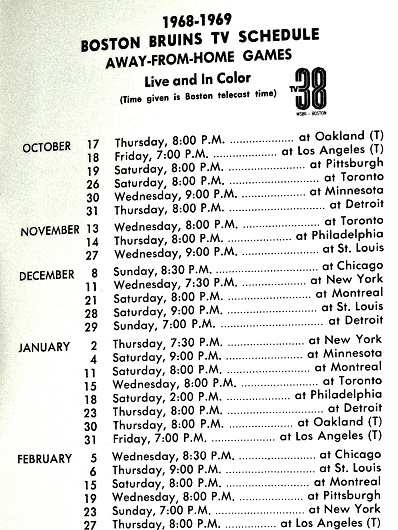 The 1969–70 season will forever belong to Orr. While inconceivably destroying every record for defensemen, he became the first blue–liner to win the Art Ross Trophy as NHL points leader. This was akin, at the time, to a National League pitcher winning the batting title. In other words, not possible. His assist total was the highest for any player to that juncture. Orr was also awarded the Hart, Norris and Conn Smythe Trophies — the latter after famously winning the Stanley Cup for the Bruins, against St. Louis, in overtime of Game 4; the photo of Bobby soaring horizontally through the air the most iconic in NHL annals. 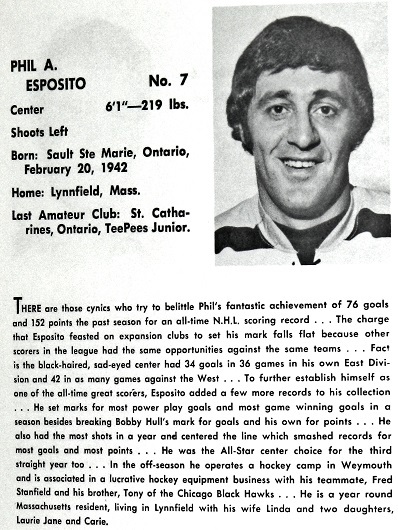 Esposito “fell” 27 points from the previous year, but had another phenomenal season (leading the NHL in goals) and established a league mark with 27 points (in 14 games) during one playoff year. BOBBY ORR 1969–70: GP–76 G–33 A–87 PTS–120. PHIL ESPOSITO 1969–70: GP–76 G–43 A–56 PTS–99. 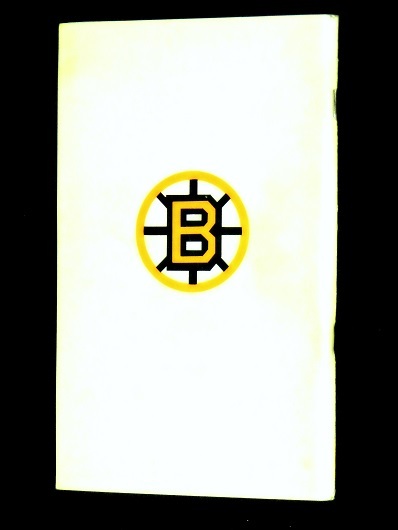 The 1970–71 Bruins were the greatest and most–prolific team in franchise history, yet will always be remembered for a colossal first–round playoff upset by rookie goalie Ken Dryden and the eventual–champion Montreal Canadiens. 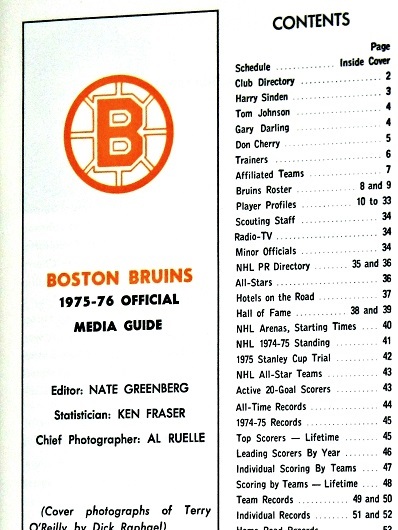 Perhaps foreshadowing that result was the curious lack — on the media guide cover (top–left) — of any reference to the club being the defending NHL champion. 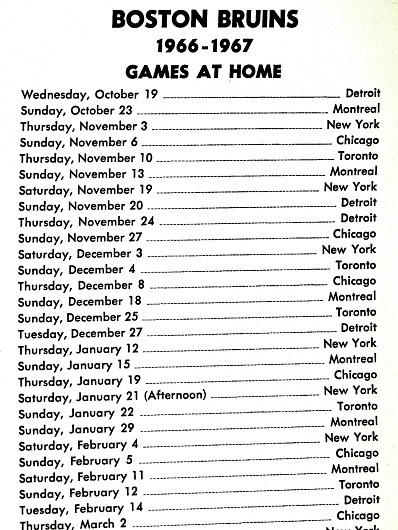 Boston finished with a record of 57–14–7 for 121 points in 78 games, breaking Montreal’s 1968–69 marks for wins (46) and points (103). The club scored a dazzling 399 goals (5.12 per game) — 108 more than second–place New York — and destroyed its own mark (303) from ’68–69. 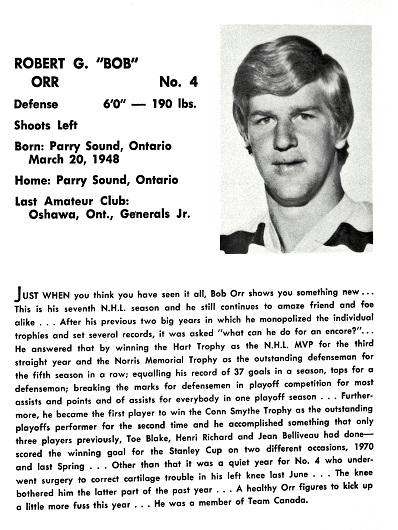 Orr became the first player to accumulate 100 or more assists in a season (and was an incomprehensible plus–124 in even–strength situations) while Esposito annihilated the league–records for goals and points, winning the Art Ross Trophy for a second time. Bobby and Phil combined for a stunning 291 scoring points. The dual–mark today is 353 and belongs to the 1985–86 Edmonton Oilers: Wayne Gretzky (215); Paul Coffey (138). Neither did that club win the Stanley Cup after a second–round upset by Calgary. 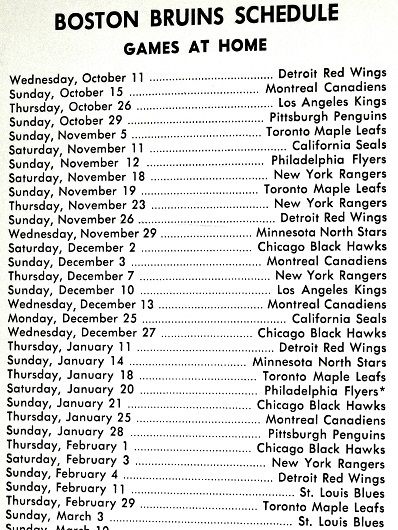 As in 1970–71, the Habs prevailed. BOBBY ORR 1970–71: GP–78 G–37 A–102 PTS–139. 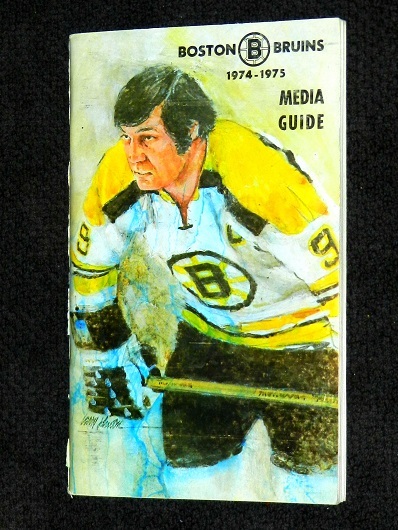 PHIL ESPOSITO 1970–71: GP–78 G–76 A–76 PTS–152. 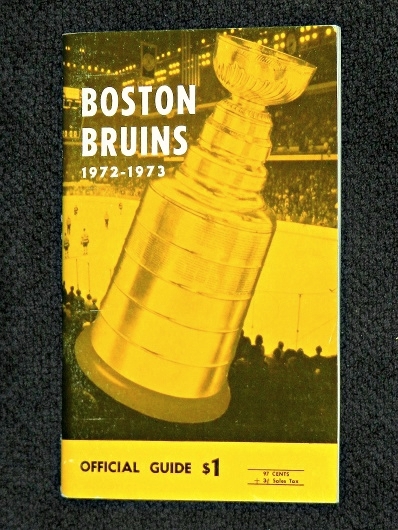 The Bruins of 1971–72 scored 69 fewer goals, but nearly equaled their record of the previous year (54–13–11 for 119 points) and won the Stanley Cup thanks to Orr’s greatest playoff performance. Bobby won the Conn Smythe Trophy with a career–best 24 points (in 15 games) and was, by many lengths, the best player during a six–game Cup final victory over the New York Rangers — fans at Madison Square Garden having to watch the hated Bruins celebrate their second championship in three years. Bobby and Phil were again superb, combining for 250 regular–season points (though 41 fewer than in ’70–71). 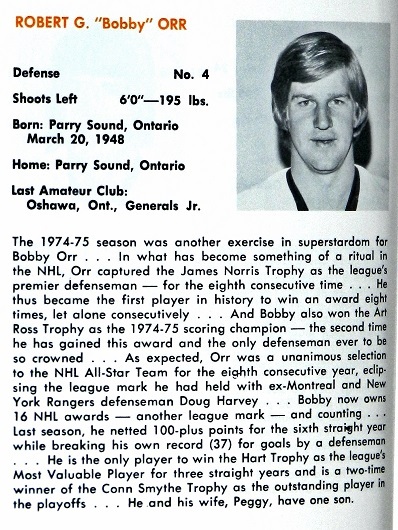 Orr, habitually, won the Norris Trophy; Espo, habitually, the Art Ross. 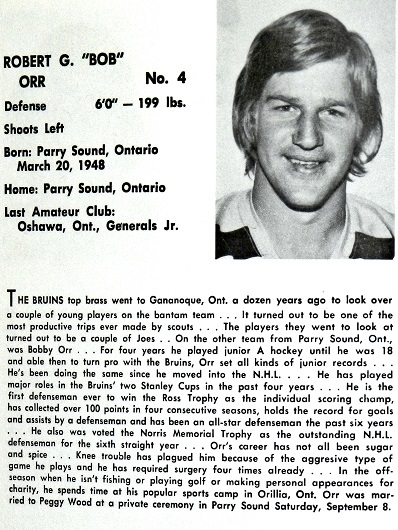 BOBBY ORR 1971–72: GP–76 G–37 A–80 PTS–117. PHIL ESPOSITO 1971–72: GP–76 G–66 A–67 PTS–133. 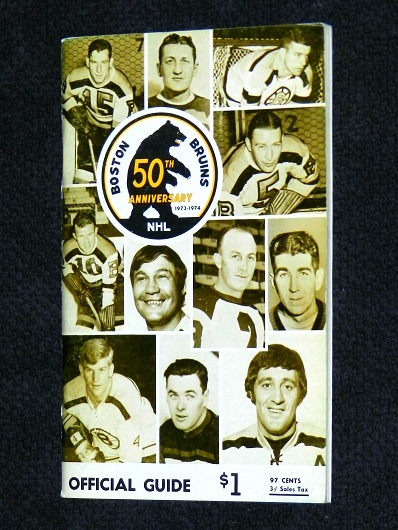 Two years later and there was no mistaking (on the media guide cover) that the Bruins had won the Cup. 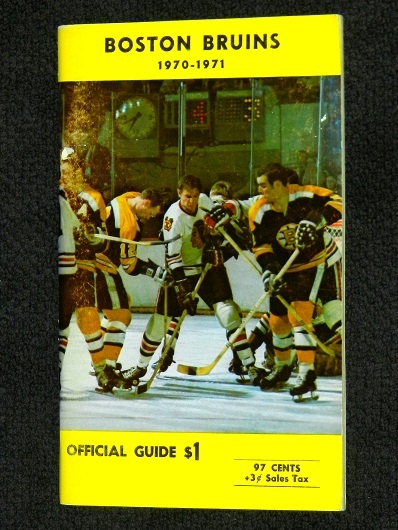 Though the Bruins again posted a fabulous record (51–22–5 for 107 points), the 1972–73 season is remembered, in Boston, for a quick playoff exit at the hands of rival New York. Less than a year after losing the Stanley Cup final at Madison Square Garden, the Rangers exacted a measure of revenge by eliminating the Bruins at the Boston Garden. It happened without Esposito, who tore up his knee in Game 2 of the opening–round series when checked hard by Rangers defenseman Ron Harris. 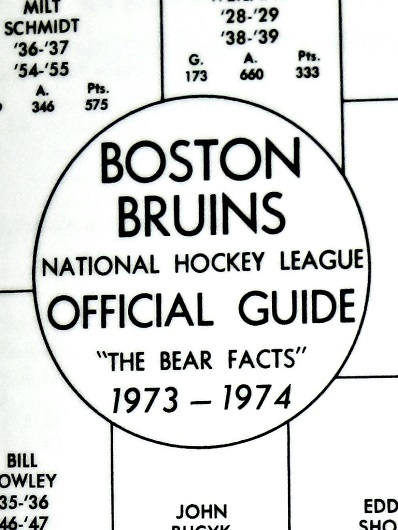 The Bruins were one and done in the playoffs for the first time since 1968. Orr missed significant time in the regular season with his on–going knee problems but still rang up more than 100 points. 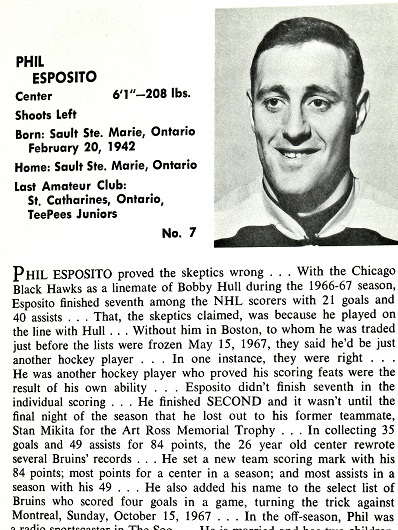 Esposito won the Art Ross Trophy for the third consecutive year. Montreal defeated Chicago to capture the NHL title. BOBBY ORR 1972–73: GP–63 G–29 A–72 PTS–101. PHIL ESPOSITO 1972–73: GP–78 G–55 A–75 PTS–130. The Bruins celebrated their 50th anniversary in the NHL with a bounce–back season and another trip to the Stanley Cup final. 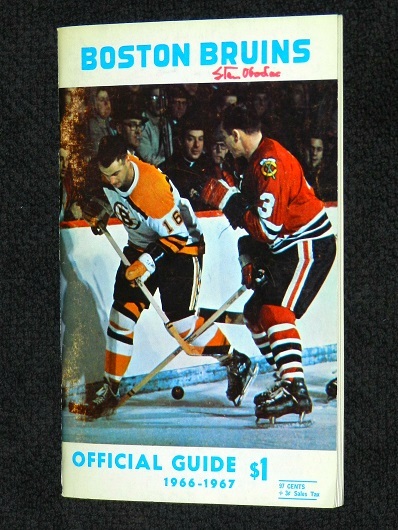 The only sour note: Boston will forever be known as the first of the pre–1967 teams to lose the championship round to an expansion club: the Philadelphia Flyers. 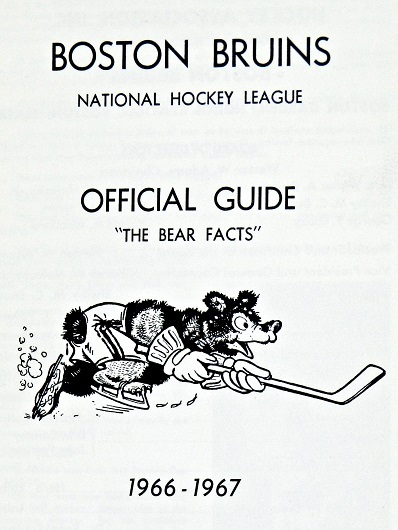 Still, the Bruins won the East Division title in a landslide over second–place Montreal, finishing with a record of 52–17–9 for 113 points, 14 more than the Canadiens (and one more than West Division–leading Philadelphia). Orr missed only four games; led the league in assists and finished second in scoring to Esposito (who led the NHL in goals for a fifth year). 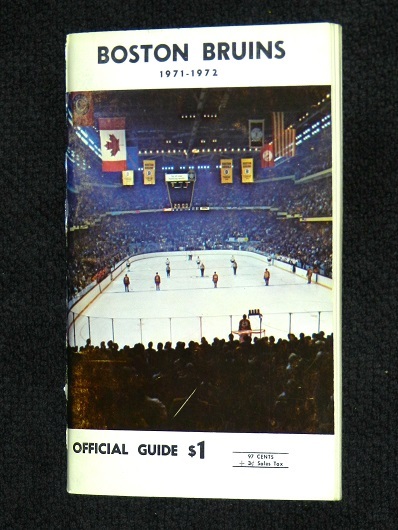 All went swimmingly until Game 6 of the final (May 19, 1974) at the Philadelphia Spectrum, when a goal by Rick MacLeish (and a shutout by Bernie Parent) gave the Flyers the first expansion title. 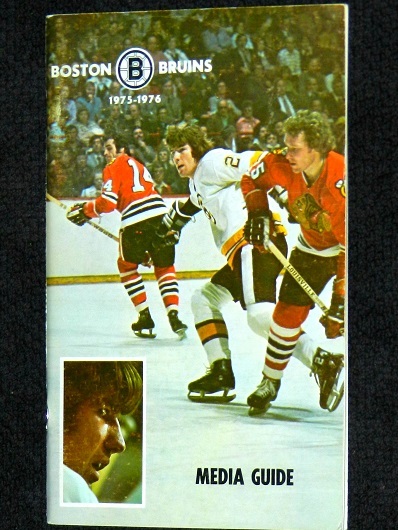 BOBBY ORR 1973–74: GP–74 G–32 A–90 PTS–122. PHIL ESPOSITO 1973–74: GP–78 G–68 A–77 PTS–145. Under a new head coach (top–right), Bobby Orr’s final full season in the NHL became his most prolific. He demolished his own record for most goals by a defenseman; amassed the second–highest points total in his career and won the Art Ross Trophy for a second time, breaking Esposito’s five–year run. Phil was hardly a slouch, finishing second in points to Orr and leading the NHL in goals for a seventh consecutive season. 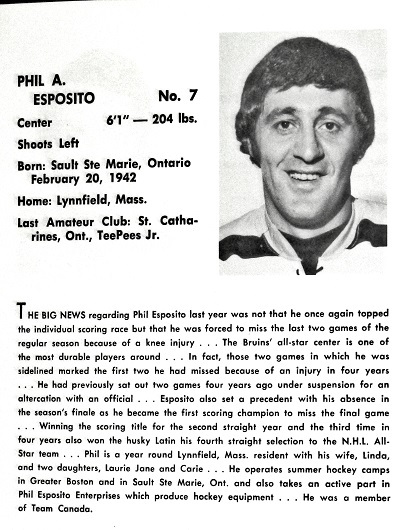 In the end, however, it was Phil’s brother, Tony Esposito (of Chicago), that continued beyond the opening round of the playoffs. 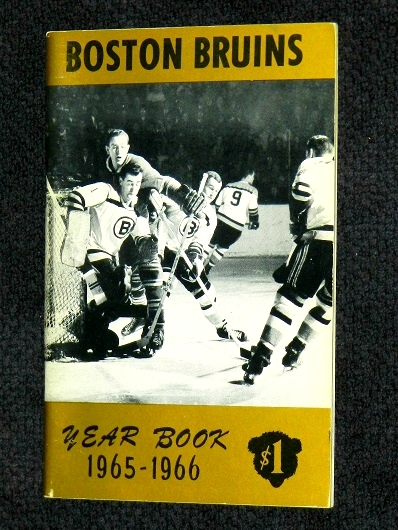 Boston annihilated the Blackhawks 8–2 in the first game of a best–of–three preliminary round at Boston Garden. But, Chicago pulled even at home when Ivan Boldirev scored at 7:33 of overtime… and finished the upset in Boston the following night (Apr. 11, 1975) with a 6–4 victory. 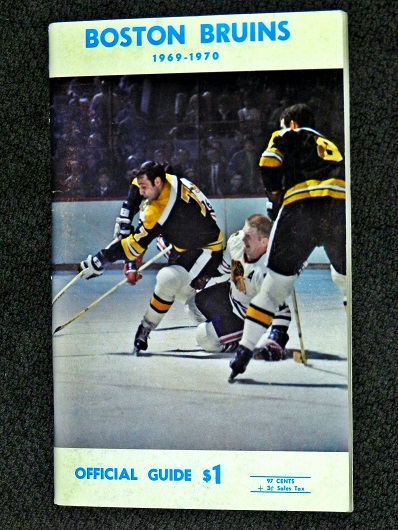 It would be the final game in which Orr and Esposito dressed as teammates in the NHL. 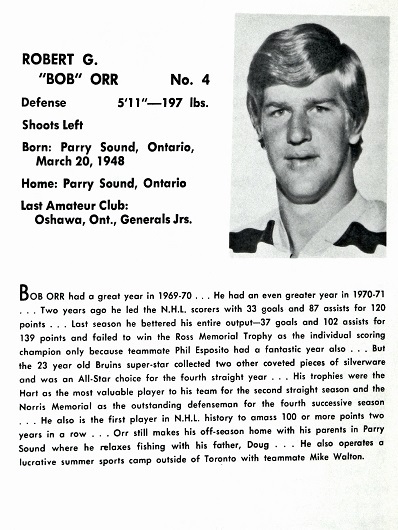 BOBBY ORR 1974–75: GP–80 G–46 A–89 PTS–135. PHIL ESPOSITO 1974–75: GP–79 G–61 A–66 PTS–127. 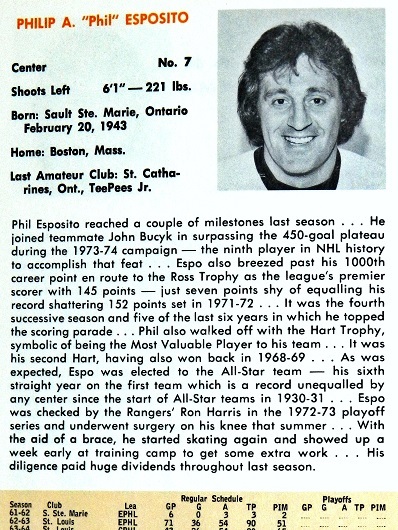 Phil Esposito was part of a shocking trade to the New York Rangers on Nov. 7, 1975. 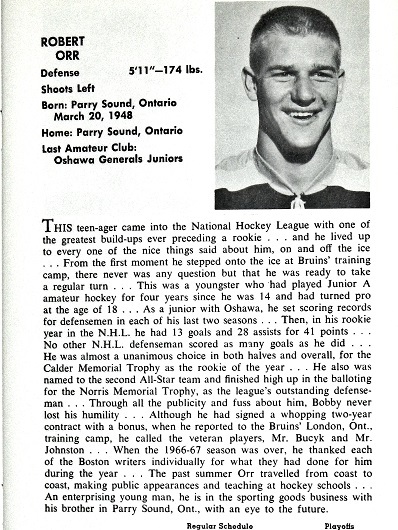 Bobby Orr underwent another knee operation in training camp and did not make his debut with Boston until the following night (Nov. 8) in Vancouver. He lasted only 10 games. BOBBY ORR 1975–76: GP–10 G–5 A–13 PTS–18. 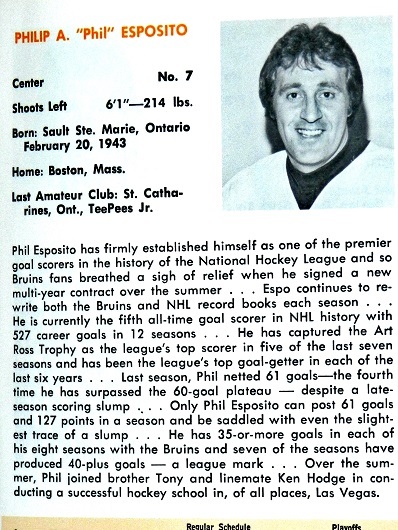 PHIL ESPOSITO 1975–76 (with Boston): GP–12 G–6 A–10 PTS–16. Great commentary on Leafs still shopping. I’m pleased that the Leafs sent some spare parts and a late first-round draft pick out the door but I’m surprised that they traded for Muzzin – In fact I had never really heard of Muzzin before today. Perhaps he’s going to flower into a top-10 forward? Perhaps he’s just a stop gap when the Leafs trade or cut bait with Gardiner? At any rate, I hope you are on the money with Pietrangelo. He does seem to have the knack for moving the puck up the ice. I’d be interested in reading your rankings of current playing top Defenseman as your good pal Elliot Friedman says everybody and their brother is trying to find one. As a Bruins fan growing up, I remember that fateful day when Phil was traded. I think I cried. It worked out pretty good for the Bruins in the end, although we only got to see Brad park and Bobby Orr play together for 10 games. Great read, Howard. As someone who grew up in St. Catharines, I can honestly say that no one who watched Phil, Ken and Freddie play in the early sixties thought the trade was anything but the most lopsided trade in NHL history. It was rivaled only by the combined impact of the two Leaf trades, one with the Rangers and one with the Red Wings that saw the leafs trade away their future.